Amongst the rules and indicators available to Central Banks for informing the Central Bank interest rate is the Taylor Rule. Conceived as a descriptor rather than a prescriber, the Taylor Rule considers the inflation rate and applies a coefficient to both the deviation from steady-rate growth of GDP and the inflation target to compute a prescribed rate. The Fed actually uses other versions of interest rate-setting rules along with the Taylor Rule. Some of these rules assume the long-term neutral Fed funds rate at 2% (the interest rate seen as consistent with 2% inflation in full employment), an assumption that is somewhat questioned in literature. Estimating the rate using models that consider inflation rate, output gap, trend growth and trend output produces a neutral interest rate. Because the neutral interest rate is indifferent to an increase in consumption output or investment output in defining an expanding economy, it is disconnected of the fundamental distinction between cycle-determined consumption and individually-determined investment identified by Keynes (the latter known as the ephemeral animal spirits). The rate varies with mismatches and variations of Price and Output levels – and Roger Garrison wisely continues explaining how it equates unemployment and inflation. 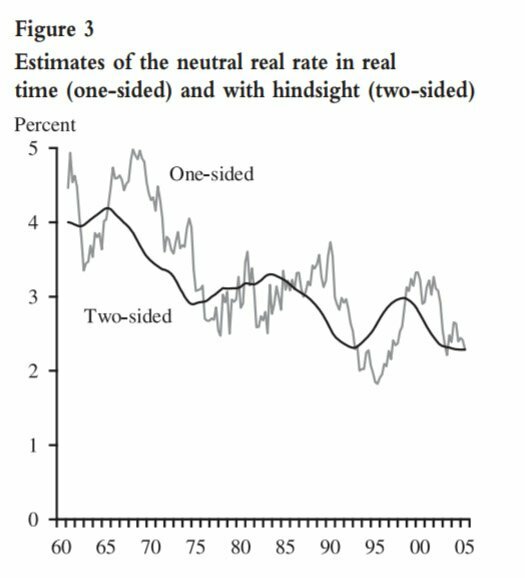 What is of concern is how this adjustment of the neutral rate of interest, fixed by Taylor at 2%, happens at the Fed. “Many projections of the natural rate of unemployment fell roughly 1 full percentage point, as did assessments of the neutral interest rate. Estimates of the potential growth rate of GDP slipped about 1/2 percentage point. This neutral interest rate, or the long-run Fed funds rate, is the average of Fed Board members’ forecasts, a “personal assessment” influenced by the economy’s risk aversion or propensity. Therefore, an increase in investment demand could push the neutral rate upwards such that the Fed Funds rate is, hypothetically, set higher than it should. Regulatory failures in containing excessive risk may have contributed to a decoupling of the loan rate from the Fed funds rate in 2003 thus a higher rate of riskier loans that defaulted more easily as house prices collapsed in 2007.